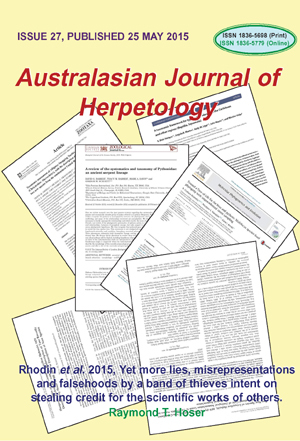 Australasian Journal of Herpetology Issue 27, published 25 May 2015. Rhodin et al. 2015, Yet more lies, misrepresentations and falsehoods by a band of thieves intent on stealing credit for the scientific works of others. ... Raymond T. Hoser, pp. 3-36. Comments on Spracklandus Hoser, 2009 (Reptilia, Serpentes, ELAPIDAE): request for confirmation of the availability of the generic name and for the nomenclatural validation of the journal in which it was published (Case 3601; see BZN 70: 234-237; comments BZN 71:30-38, 133-135) (Unedited version of document submitted to and published in Bulletin of Zoological Nomenclature in March 2015). ... Raymond T. Hoser, pp. 37-43. Raymond T. Hoser, taxonomy publications to end 2014 (about 114 papers) (list). ... Raymond T. Hoser, pp. 44-51. Raymond Hoser, Nomenclatural Acts to May 2005 (729). ... Raymond T. Hoser, pp. 52-63. RE: Evidence supports taxonomic changes. ... Scott Thomson, p. 64.